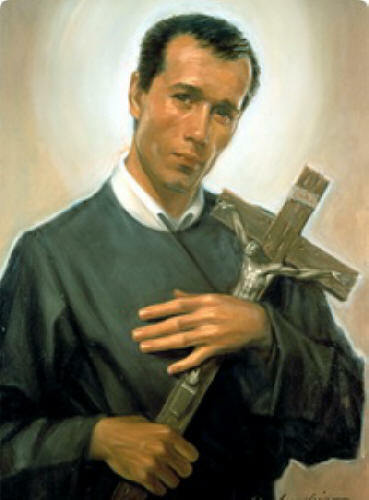 We celebrate the feastday of St Gerard Majella on the 16th October. Gerard Majella was born in 1726 in the southern Italian town of Muro near Naples. As he grew up, Gerard spent a lot of time in prayer and he developed a great love for God. He became known for his kindness to people and led a frugal life, so that he could share his tailor’s earnings with the poor. When he was 23 he left home to become a Redemptorist. He was particularly faithful to prayer before the Blessed Sacrament, meditation on the Passion of Jesus, and devotion to our Blessed Mother. His work, which varied from cleaning and cooking to giving spiritual advice was an inspiration to all. He was well known too for his care of the poor and distressed. At the age of 29, he got tuberculosis and died on October 16th 1755. He was declared a saint by Pope Pius X in 1904.